While best known as roadside assistance saviors, the AAA organization offers much more for its members, with services across insurance, hotel deals, and more. A large part of that “more” is its travel agency. And at AAA Minneapolis headquarters in nearby St. Louis Park, the iTravel Advisor travel agency has embraced digital media as a means to promote its services to members that stop by for any number of reasons. With approximately 205,000 members to its name, AAA Minneapolis has found an immersive tool to engage and inform those waiting in the lobby area in the form of a 13-foot, 4-inch-wide by 8-foot, 6-inchtall video wall. Tierney Brothers designed, built, and integrated the immersive video wall at AAA Minneapolis headquarters, which uses nine 46-inch 1080p NEC displays, Carousel software, and BrightSign media players. Tierney Brothers of Minneapolis was engaged to design, build, and integrate the immersive 1080p video wall. Positioned in the center of its main lobby, the video wall treats visitors to a dynamic display of colorful, visually engaging content—such as video clips, slides, photos, and ads—designed to whet their travel appetites as they wait to see an agent. Equipment choices included Tightrope Media Systems and its Carousel Digital Signage Software for content creation and management; and BrightSign XD230 HD media players. A two-speaker JBL sound system with an amplifier provides sound from inside the wall. Krisko and his team used D-Tools for the conceptual design phase, carefully laying out what the inside of the wall would look like across mounting systems, media players, and monitors. Tierney also designed the low-voltage electrical infrastructure and worked with a local electrical contractor to confirm power requirements for a nine-monitor (3x3) wall. A standard network cabling architecture married the Carousel server with nine BrightSign players over IP, without any needs for conversion or extenders. With nine 46-inch 1080p NEC displays and robust mounting systems from Chief Mounts, Krisko noted the main concern at the integration stage was weight support. For the video wall technology, Krisko worked with Carousel software and BrightSign media players. He points to reliability and low power consumption as key BrightSign benefits. The data-rich capabilities of Carousel also enable seamless connectivity to any number of external feeds and ensure reliable display of real-time data feeds. 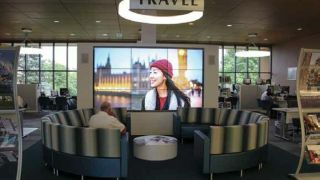 The video wall also incorporates advertising mostly related to the iTravel Agency retail business on site, as well as sponsored advertising that promotes products available in the agency’s Travel Store, providing an ROI path for the agency. However, the stunning travel imagery is what makes the project most worthwhile for the iTravel Advisor team and its clients.